I’ve cut back on blogging because there are so many blogs and so few experts. But readers always seem to enjoy blogs about the seasonal events where I live, hence this post. As you know (if you’ve followed for a while), summer for me is all about my garden. (And golf and fly-fishing.) I’m waaay up in the Rockies, so the season is brief and sweet. This year we’ve had little rain and the fire danger is extreme. The xeriscape lawn is in God’s hands. Only my berm, plus a few pots and planters, receives irrigation. When I planted the garden I used currant plants as a natural hedge between the more cultivated, house-side of the big berm, and the wild, grassy side that faces the street. 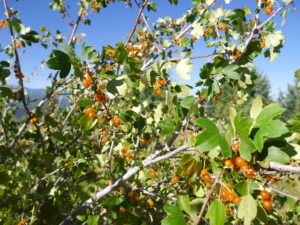 The currants are full of fruit this year—something that the chipmunks and small birds have figured out. I realized that if I was going to harvest currants, I had to do so in a hurry! I clambered (that’s the most generous term for my movement) on the berm yesterday, staining my fingers with the juice from white (they’re really peach-colored) and black currants. I got three cups, leaving about three times as many fruit on the bushes. After sorting, tipping and tailing, and washing the currants, I baked scones. 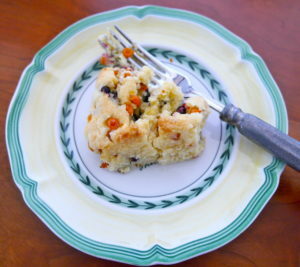 There’s nothing like warm currant scones (recipe below) on a crisp morning that reminds me that fall is coming too soon. Whisk cream and egg. Mix flour, sugar baking powder, and salt in food processor. Cut the butter chunks into the flour mixture. Gently fold in the currants. Stir in the egg-and-cream. 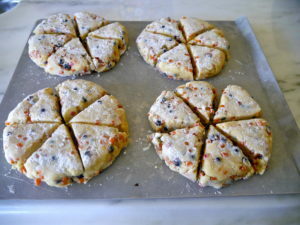 Form the dough into two balls, then flatten into six-inch disks. Cut the disks into six pieces, like a pie. Brush with additional melted butter, and sprinkle with Demerara sugar. Bake about 20 minutes, or until golden. Let rest 15 minutes before serving.